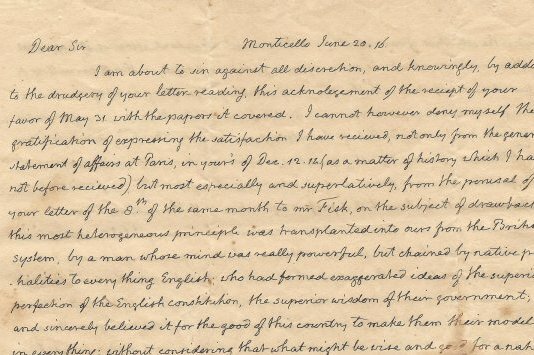 Pictured is a letter written by Thomas Jefferson in 1816 that's currently for sale by a Philly-area collector. A centuries-old document penned by one of the nation's Founding Father's is up for sale in a Philly suburb. Ardmore-based collector Nathan Raab is selling a letter written by Thomas Jefferson in which the former president outlines his vision for the country. The letter is dated 1816 and addressed to William H. Crawford, former U.S. Ambassador to France. In it, Jefferson discusses the relationship between commerce and war — much of it was written during the War of 1812. Raab calls it "one of the great letters [Jefferson] ever wrote" on his website. He told CBS Philly that he acquired it from a Mississippi man who called after finding it in his attic. Turns out that man was a descendant of Crawford's, according to Raab's site. How much for the piece of history? A whopping $375,000. If you're too broke to even dream of making such a purchase, don't fret. After all, as Jefferson once said, "The glow of one warm thought is to me worth more than money."